Jiminy was admitted to RAPTOR Inc. for rehabilitation in June of 2011 as a result of a left wing injury. He was found along the bike trail in Morrow, Ohio. Although his wing healed, he was never able to fly well enough to hunt and survive on his own. 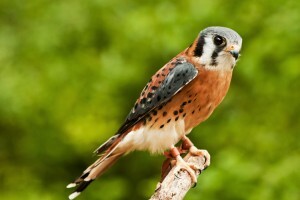 He was transferred to another raptor center who was looking for a male American Kestrel to join their educational ambassadors. Jiminy returned home to RAPTOR Inc. in the spring of 2015.